Boring, monotonous Jameson Theodore, or Bipolar Man as he calls himself, is off his meds – unknowingly. It’s been two weeks since Neurotic Nigel secretly switched out his pills, and the universe has taken notice. Manic Mandy’s idea to start a toddler driving school gains irreversible momentum when Jameson mentions the idea to the executive team at his company – Ava-Reeshus. Needing investors and a lot of money up-front, Jameson, Mandy, Midlife Crisis Max, and Hypomania Harrison go all-in on the sales pitch of the century. Their target is Jameson’s boss – Anxiety Andy – the CFO at Ava-Reeshus. Everything runs through him. Andy is a brilliant, but money-centric enigma, and he will stop at nothing to get what he wants. Desperate to get out of his boss’s daily clutches, Jameson must go toe-to-toe with the man he despises the most. And, the game is being played on the most dangerous turf of all – Anxiey Andy’s. On Jameson’s side – the cosmos – conspiring to tip the scales of karma toward the people who deserve it the most. Unmistakable omens begin to reappear. The timing is too perfect to ignore. His dream team is set. Coincidences line up to help guide him down the path toward salvation. Nothing can get in his way, not even his own family. The crossroads of Jameson’s life has collided with the investment opportunity of a lifetime, and he knows everything is on the line. There’s a fortune to be made, dreams to be realized, lessons to be taught – to greedy, unethical, and downright unlikeable company executives, and destinies to fulfill. If Jameson and friends pull it off, their lives will never be the same again. 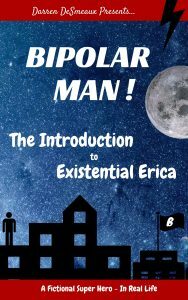 The second installment of the Bipolar Man! Comedic Adventures series launches Jameson and his friends into an intense, hilarious, action-packed storm of promise and uncertainty – where emotions run high, decisions carry unbearable weight, and moral boundaries are as abstract as Anxiety Andy’s intentions. The journey will be treacherous… packed full of insurmountable barriers and unbearable emotions, and it will test every ounce of faith Jameson has stored inside. Soon, his friends, his family, and the entire world will understand. 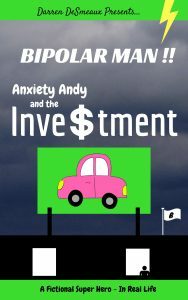 The time has come for Bipolar Man to make his mark, no matter the sacrifice. Everyone is depending on the outcome.